You might know I like a good Citroen DS and this is one of the coolest I have ever seen. Modded by Andrew in the States it packs a real punch in the form of a 400HP LS1 V8. It's my idea of a cool car because it has a modern chassis and drive line while keeping the looks of the 'sexiest car on the planet'. 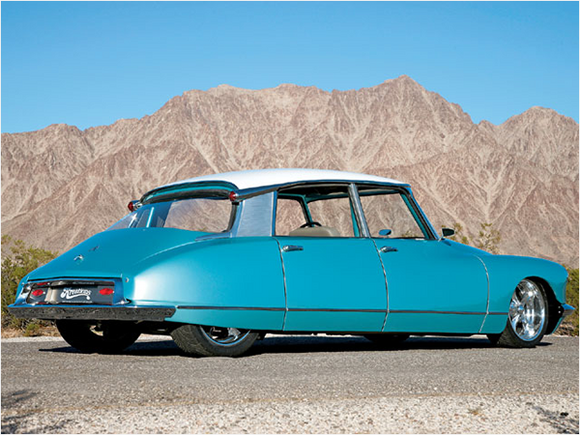 This is Andrew's description of his car: "Classic French 1964 Citroen ID19 rethought as American hot rod. Everything is new under the skin: 400hp, new chassis, transmission, wheels & interior. Truly unique." Oh yeah - I need that car. Beautiful, but is 400hp really going to be enough? 400hp would be enough if it doesn't weigh much and thanks for the spell check. I pressed 'post' a bit quick there.